Liquid crystals are perhaps most well known for their use in electronic displays, but many biological molecules, such as those in cell membranes are forms of liquid crystals, as are some detergents and clays. What is unique about liquid crystals is that they exhibit properties of both liquids and solids. A liquid crystal may flow like a liquid but be more ordered in its molecular structure, where each molecule is aligned with others in the phase. Researchers have been able to measure some of the coefficients which control liquid crystal behavior. Other coefficients, such as the “saddle-splay” deformation (see featured picture), have been impossible to measure directly. Recent experiments have suggested that saddle-splay elasticity could play an important role in better understanding and controlling liquid crystal materials. However, that requires direct and accurate measurements. New simulation protocols developed by a team of researchers at the University of Notre Dame and the University of Chicago enable the accurate measurement of the elastic coefficients which control the behavior of liquid crystal systems. More importantly, these new protocols resolve the question of saddle-splay instability in 5CB, the most common experimentally studied liquid crystal. Their study, titled “In Silico Measurement of Elastic Moduli of Nematic Liquid Crystals” and highlighted in the March 9, 2018, issue of Physical Review Letters, is the first step in being able to better understand and control the properties of liquid crystals. A faculty member since 2014, Whitmer’s work involves the modeling of “soft” materials using advanced simulation algorithms. 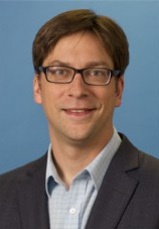 His research group is active in several fields, including studies of liquid crystalline gels, elastomers and sensors for use in novel technological applications; equilibrium and nonequilibrium polyelectrolytes for use in new nanomaterials and devices; and colloidal clustering and assembly for a variety of structures. Originally published by Nina Welding at conductorshare.nd.edu on March 12, 2018.